The fifty cent coin was first introduced with decimal currency on 14 February 1966. The original design featured the Commonwealth Coat of Arms struck on a coin made from 80% silver. However as the silver price rose above the face value of the coin the Mint suspended striking of the coin in March 1968. Although it was rumoured that the Mint had lost money striking the fifty cent, all the metal used in the manufacture of the 36.5 million coins produced was purchased before the price rises. Apart from the uneconomic cost of continuing the issue of the silver fifty cent coins, increasing confusion arose regarding the similarity in sizes between the circular fifty cent and the twenty cent coin. 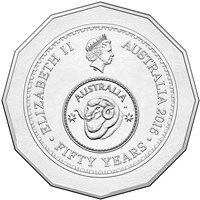 The decision to reissue a fifty cent coin considered not only a change to materials but also different shapes to help solve the confusion with the twenty cents. A new shape and alloy was reintroduced into circulation in September 1969. Commemorating the bicentenary of James Cook’s 1770 voyage. Based on a painting by John Webber. The inclusion of Cook’s signature was thought to be the first use of a facsimile signature on a coin. Designed by Stuart Devlin. Commemorating the 25th anniversary of the Accession of Queen Elizabeth II. Based on a central wattle blossom symbol of Australia surrounded by 25 overlapping crowns. Designed by Stuart Devlin. Commemorating the marriage of HRH the Prince of Wales and Lady Diana Spencer. Designed by Stuart Devlin. Commemorating the Brisbane XII Commonwealth Games. Incorporates the Games symbol designed by Hugh Edwards to reflect the form of a kangaroo in full flight. Designed by Stuart Devlin. Commemorating the Australian Bicentenary. Designed by Michael MacLellan Tracey. Celebrating the 25th anniversary of decimal currency. The original image of the stud ram Uardry 0.1 by George Kruger Gray used on the shilling from 1937 to 1964 was reworked by designer Horst Hahne. Celebrating the United Nations International Year of the Family. Designed by Carolyn Rosser. Celebrating the 50th anniversary of the end of World War 2. Designed by Louis Laumen and Horst Hahne, sculpted by Horst Hahne. Commemorating the 200th anniversary of the voyage of Bass and Flinders. Commemorating the visit of Queen Elizabeth II. Designed and sculpted by Vladimir Gottwald. Commemorating the Centenary of Federation. Featuring the 1912 Commonwealth Coat of Arms granted by King George V.
Commemorating the Centenary of Federation. Featuring the Coat of Arms of Canberra, granted by King George V in 1928. Designed by CR Wylie. Commemorating the Centenary of Federation. Featuring the Coat of Arms of NSW, granted by King Edward VII in 1906. Designed by William Applegate Gullick. Commemorating the Centenary of Federation. Featuring the Coat of Arms of Norfolk Island, granted by Queen Elizabeth II in 1980. Commemorating the Centenary of Federation. Featuring the Coat of Arms of the Northern Territory, granted by Queen Elizabeth II in 1978. Commemorating the Centenary of Federation. Featuring the Coat of Arms of Queensland, the oldest in Australia, granted by Queen Victoria in 1893. Commemorating the Centenary of Federation. Featuring the Coat of Arms of South Australia, granted by Queen Elizabeth II in 1984, replacing the original granted in 1936. Commemorating the Centenary of Federation. Featuring the Coat of Arms of Tasmania, granted by King George V in 1917. Commemorating the Centenary of Federation. Featuring the Coat of Arms of Victoria, granted by King George V in 1910. Commemorating the Centenary of Federation. Featuring the Coat of Arms of Western Australia, granted by Queen Elizabeth II in 1969. Commemorating the Year of the Outback. Designed and sculpted by Wojciech Pietranik. Commemorating Australia’s volunteers. Designed and sculpted by Vladimir Gottwald. Primary School design competition winner John Serrano. Sculpted by Vladimir Gottwald. Commemorating the 60th anniversary of the end of World War 2. This design was inspired by a photograph in the Australian War Memorial collection of a scene of a burial at El Alamein in 1942. Designed and sculpted by Wojciech Pietranik. Secondary School Commonwealth Games Design competition winner. Designed by Kelly Just. Sculpted by Vladimir Gottwald. Commemorating Australia Day. Designed and sculpted by Vladimir Gottwald. Commemorating the 50th anniversary of the Australian Institute of Aboriginal and Torres Strait Islander Studies – AIATSIS. Featuring the AIATSIS logo, based on the boomerang totem of the Gu’na’ni (Kunjen) people of North Queensland. 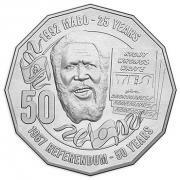 50th anniversary of the 1967 referendum and the 25th anniversary of the Mabo decision. Designed in collaboration with Boneta-Marie Mabo, and Eddie ‘Koiki’ Mabo’s granddaughter. 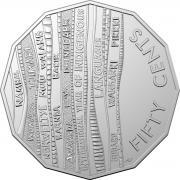 The Royal Australian Mint along with AIATSIS recognises 2019 as the International Year of Indigenous Languages.